Here’s my adaption of the recipe Green Tea Chiffon Cake from the same book Okashi sweet treats made with love. 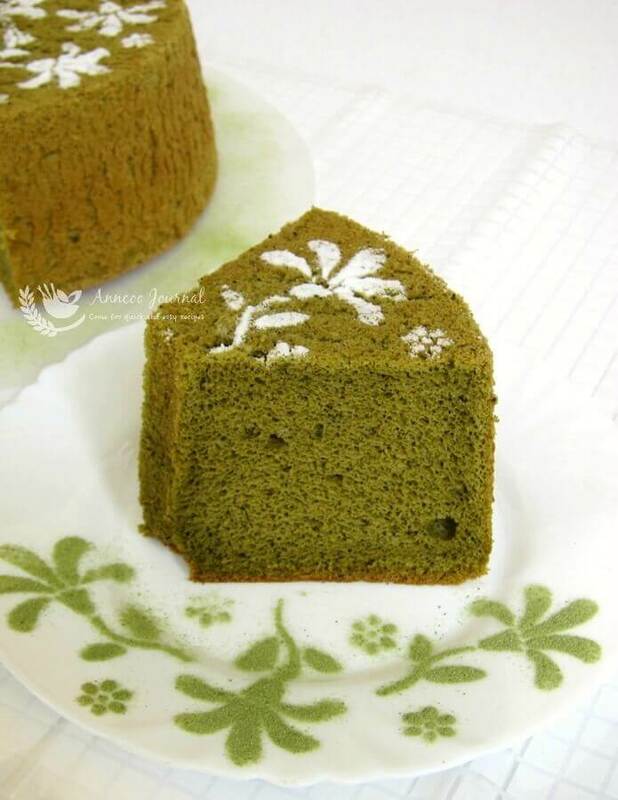 I just love the aroma and taste of matcha or green tea powder in this light airy cake and it was gone within a day. I am sending this to Aspiring Bakers #1 Chiffon Cake (Nov 2010) hosted by Small Small Baker. Sift flour and green tea powder together twice. Combine egg yolks and sugar in a bowl and mix well. Add water and corn oil and blend together. Add flour and green tea powder mixture and mix until batter becomes sticky. Set aside. **Add one third of meringue to egg yolk mixture and fold in lightly, then add remaining meringue and fold to incorporate completely. 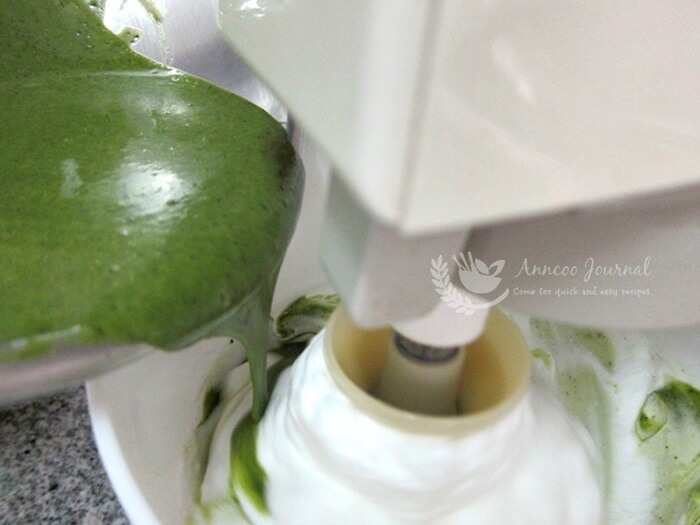 **I've changed this method the other way round ~ Slowly pour all the egg mixture into the meringue at low speed then stop machine. Using a rubber spatula and fold the mixture well. Pour batter into an ungreased 20cm chiffon cake pan. Place in the oven and bake for about 50 minutes. tWhen cake is done, remove from oven and turn the pan over. Leave cake to cool completely in pan. Do I multiply by 1.5 to make this cake for a 24 cm pan ? Yes Mel, use 1.5 recipe to make a 24cm pan. Hi Michelle, Sure if you like to add the red beans.Not too much, just about 100g. Hi, I just start to learn baking chiffon cake. May I know what is the purpose to adding water? Hi Emily, Adding water, milk or juice will helps the cake more moist and soft. hi, i have tried this recipe for 2 times using a 17cm chiffon cake tin (i halfed the recipe) and it works perfectly! This time i decided to follow the original cake size (20cm), however my cake drop out of the tin just after 1 min of inverting for cooling. Do you have any idea what may cause it? I didn’t grease the tin too. Thanks. Hi Chloe, probably you need to bake the cake a little longer due to oven temp varies. The cake will drop out either it is not fully cooked or the egg whites need to whisk to stiff peak form. Hi. 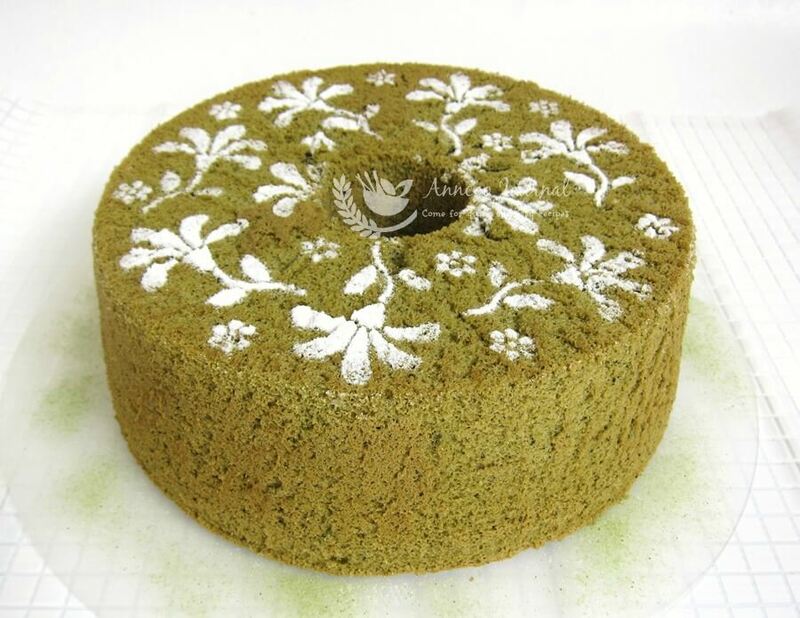 I have tried your matcha chiffon cake. But I’m using 3 eggs for 18cm mound. It’s soft and yummy. The only thing is after I over turned it, the bottom that becomes the top caved in about 1 cm. May I know why. Thanks. Hi Lee, Probably your egg whites were not whisked to the stiff stages. You may whisk it longer for 1-2 minutes the next time when you bake this cake again. I would like to know the size of egg u used in this recipe? Do u use the same size of egg for your other chiffon recipes too? If I use cake flour, do I need to add baking powder? Hi Grace, I always used large eggs for most of my bakes. That is 70 egg with shell. There is no baking powder in cake flour, therefore you’ve to add it as stated. Hi Adelene， Here are the exact measurements from my kitchen. water 70g = 70ml 90+20g sugar = 1/2 cup _ 1 tbsp. Use 1/4 of sugar to the egg yolks and remaining to the egg whites. Actually for the measurement of water and sugar, don’t have to be too exact. Is fine with a little plus and minus. Thanks Ann for your recipe. I tried it yesterday and though the cake didnt rise much it was soft. I am still not getting my chiffon cakes nicely. I seriously suspect its my egg white. I never beat it just right. I almost always underbeat it so my cake doesnt rise n is dense n wet. On occassions I overbeat it, I take a long time to slowly mix the small lumps of white mixture while folding but the cake is soft. Hi, I always used large egg for baking cake. When whisking up the egg white, start from low speed till foamy and add sugar in batches.Then when the volume starts to form, increase the speed to medium and continue to whisk the egg white till glossy and until stiff peaks. air inside?? – sorry for my ignorance! Wendy, In fact I personally prefer the reverse way of adding the egg yolk into the egg white. Because I find this is a quick way to do the mixing. After you whisked up the egg white to stiff, switch the speed to the lowest and slowly pour in the egg mixture. Stop machine after you've added in the yolk (do not overmix), then fold gently with a spatula but you can still do the old method if you prefer. Ann, since its the easier and quicker way to do the mixing and from the look of your cakes, im going to give it a try.Wish me luck coz im bringing this cake to a potbless Mothers' Day celebration! thanks! Yes, cake flour can be used. I will definitely try your recipe as well. Thanks for sharing it! Wow another perfect cake! I want some! I can almost feel the softness in my mouth, excellent texture and beautiful decoration, Ann! Jude ~ Hope you can get matcha powder in London. Wow! This cake takes my breath away! What a marvelously designed cake. Spectacular indeed! Bravissima!!! OMG! I love green tea..this looks cute and delicious! Vix ~ This matcha powder is actually imported from Japan. You may get this from Japanese grocery store. Elin ~ I think the trick is how you whisk the egg white, folding and the timing of baking is also very important. Love the decor! So pretty! This green tea chiffon cake is our all-time favourite dessert. I often bring one to party, everyone likes it. What a lovely idea. I'm amazed that you get such a lovely green colour without any colouring. I definitely want to try this one, but not sure where I would get the Green tea powder. Do most Asian supermarkets stock it? I can see from the photos that the texture is great and I love the flavor of matcha. A wonderful cake. Hi Friends, Thank you for taking your time reading this post. Those who are interested to join this challenge, please submit your chiffon cake to Small Small Baker. Ah Tze ~ Thanks. So glad you've joined this challenge. Belinda ~ Thank you. Just follow my recipe and I'm sure you'll love this cake. Cheah ~ You're welcome. Please join the challenge. Tasteofbeirut ~ Thank you for your compliment. Judy ~ Thanks! Green tea is very popular in Asia and this green tea powder is originated from Japan. Rebecca, Little Inbox ~ Thank you! Biren ~ Thanks. I love matcha too and there are few more matcha recipes that I bookmarked from this book. DG ~ hehee..because of the dull color of the chiffon, that's why I sprinkle some icing on top. Faithy ~ Thank you for your nice words and thanks for your information, I have ribena at home. Esther ~ I'm sure you can do it. Hanushi ~ Have a try. Just make sure the mixture is not overbeat. beautiful green tea chiffon i love your stencil decorations! Oh mine, love the flowers decoration so much! Looks beautiful dear, I am trying to imagine the aroma of the cake. Looks delicious! I love the presentation and those stenciled in icing! So pretty! And your chiffon is perfect..so flat and nice and fluffy!! I love anything green tea even if it is chiffon..which i usu not a fan of since i like rich cakes..lol! Wouw … beautiful chiffon! With additional touch flower design on top made the cake looks even perfect. Ann, your baking creations are so lovely. If only I can bake like you. Matcha flavored cakes are so good. Feel like having a slice now. It's such a beautiful chiffon, so artistic! The design on top of the cake is lovely, really nice job you did. The color of the cake itself is a little offputting though. I love chiffon cakes and this one is the prettiest one I have seen so far! Beautiful job! Bookmarked straightaway, Ann! It's just awesome and so nicely decorated! How do you do these??? You make my favorite kinds of cakes. The decoration is absolutely lovely. I like your green tea chiffon cake! the colour looks pretty and yummy!